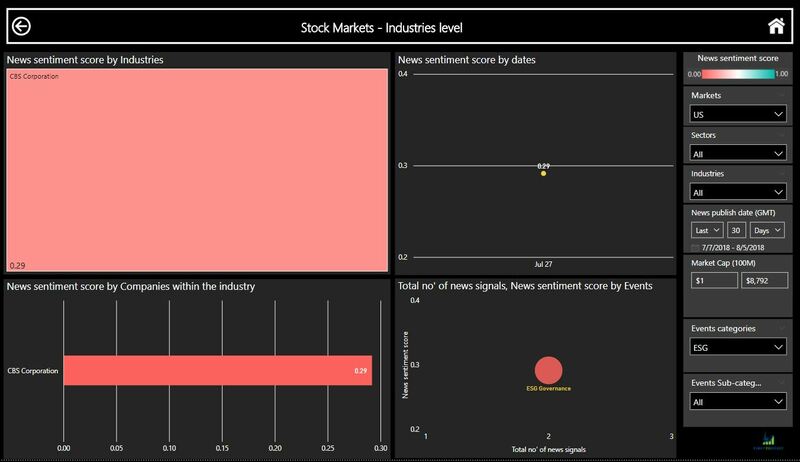 This dashboard presents our data on ESG events using news sentiment score on a scale between 0-1 (above 0.5 consider bullish sentiment and below 0.5 consider a bearish sentiment). Drill down on the media industry for a 30 days period we can find that CBS had ESG events which impact the companies news sentiment score. 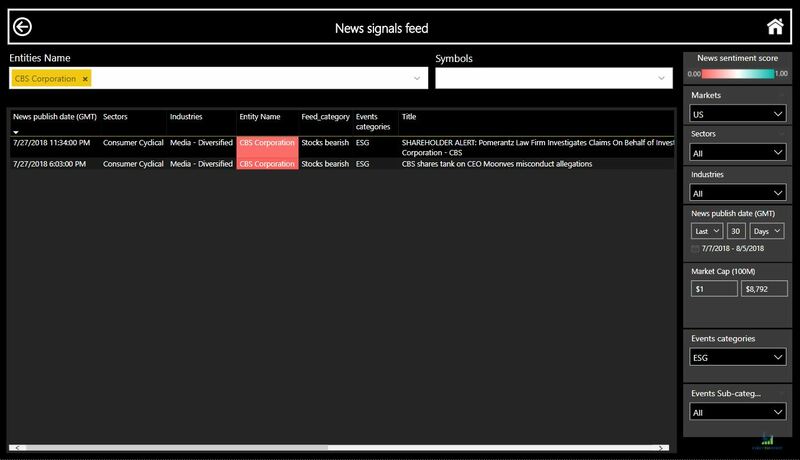 Moving to a news signals feed dashboard and we can see that CBS had 2 ESG events: Pomerantz Law Firm Investigates Claims On Behalf of Investors of CBS Corporation and the CEO was accused of misconduct allegations. These events send the Company news sentiment score to 0.29 which indicate strong bearish sentiment for the company. The ESG events category is function similarly to any other event category that we cover and can be found and sorted by in any types of dashboards and can be drill down to present the subcategories, in this case, Environmental, Social, and Governance. 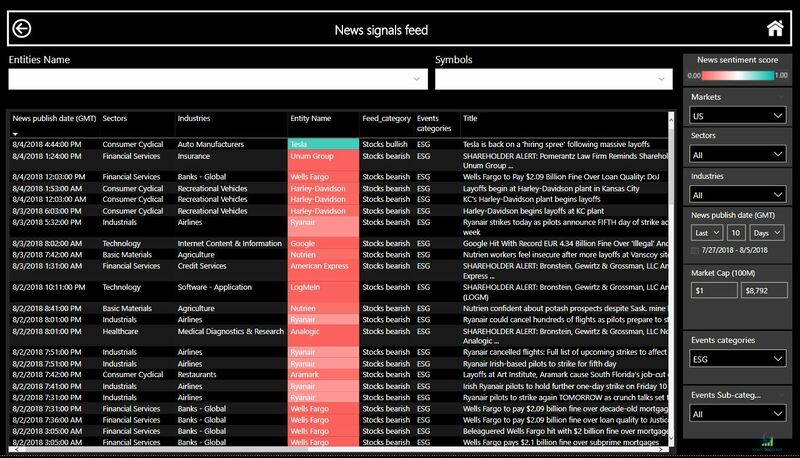 Using big data and NLP technologies to capture alpha by collecting, structure and reveal events from news articles, press releases, and financial social media. 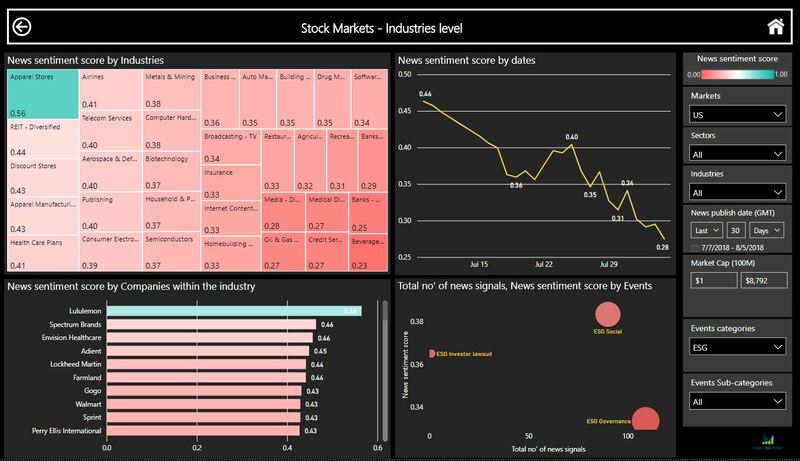 Our data is presenting on visually compelling, interactive dashboards on your PC and mobile. Using a hybrid model to provide high accuracy of data classification, context, and sources to ensure maximum value for our clients. Generating events scoring based on novelty, the position of the event, (header or news body), the event scoring index and the repetition of the event in the media. 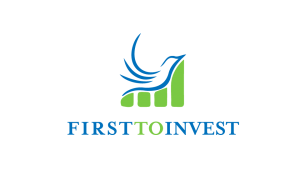 Financial reports related events, M&A, new deals, partnerships, ESG, regulatory decisions, management change, expansions, new products, FDA decisions, macroeconomics and more…..
Cover press releases, news stories, and financial social media on companies, currencies, commodities, central banks, cryptocurrencies, macroeconomics and ETF’s 24/7. Our data is presenting on easy to use interactive dashboards on the web or on your phone, get alerts when data changes, and drill into details. Alpha is at your fingertips.